Scaring the C++P out of KS1 teachers…. on the ICT curriculum. There was much evidence that work for students, particularly in Key Stage 3 when they went to Secondary school was not challenging, and at worst little more than a continual rehash of Microsoft Office skills. Of course that caricature has power as anecdotal evidence and it was not the case that ICT had become moribund in all schools. But during my time as a researcher going into schools I did see some pretty boring ICT lessons and talked to students who felt they did much more creative things with computing outside the school curriculum. So Gove sucked ICT into the maelstrom of his National Curriculum reforms, and the term ICT was ditched in favour of the more rigorous term ‘computing;. During the planning of the curriculum many bodies (including the British Computer Society and Mirandanet) gave evidence as to what should be in the new curriculum, and a concensus of such emerged that there should be more emphasis on programming and coding. So the conceptual workout provided by figuring out how to write computer programs was to replace endless dicking around with fancy fonts and Word Art. Which is probably no bad thing. But reading the curriculum today I was struck by how the concept of rigour had rather taken hold of the thing too much, in fact it seems to have created some rather questionable ideas about what can be taught appropriately at certain ages. I reserve my comments here solely to the KS1 curriculum, with a reminder that these are children between the ages of 5 and 7.
actually, let’s just take those first 4 words ‘understand what algorithms are’ and look in a little more detail about what is being asked of young children and their teachers here. If you set off to find a hard and fast definition of what an algorithm is, you will soon realise that a straight forward unequivocal definition is not easy to find. Computer scientists and mathematicians will argue about exactly what constitutes an algorithm and even a cursory search through literature in the material will soon have you enmeshed deep in the conceptual difficulties of computation, Turing Machines and Hilbert’s ‘decision problem’. At its most basic an Algorithm is a series of steps through which a problem can be solved (in this case by a digital computer). But an algorithm is not necessarily the same as a computer program. This made a very pretty pattern on the screen and delighted teenage boys, and it is clearly a computer program (when you type RUN it did something). But it’s not an algorithm because it doesn’t solve a problem, and even worse it’s non-terminating, the program will run for ever until you hit the ESC key and saved the computer from its hellish loop. An algorithm has a clear set of steps and a procedure for termination (just like a good drinker, it knows when it’s had enough and stops) At the other end of the scale from my jejune tinkering with the Commodore PET in 1983, it is the case that more complex computer programs may have thousands of algorithms contained within them. Most often these are nested like Russian dolls with the output of one algorithm feeding into the input of another in myriad patterns of dizzying complexity (to us humans at least). The next time your computer screen freezes, you can be sure that somewhere in the bowels of your computer two or more algorithms have had a falling out and the consequences of this are slowing your game of angry birds to an agonising crawl. The conceptual complexities of algorithms are fascinating but is it not too much to expect KS1 teachers to grasp these when they have to be generalists, teaching every subject in the curriculum? This is not meant as patronising towards these teachers, in fact I have nothing but admiration for their skills and I know enough about schools to realise I would probably last about 15 minutes in charge of a KS1 class. The question remains why the curriculum obsesses about teaching this notion of an algorithm to such young children and what they think will be gained from doing this. I imagine that this first part of the curriculum will scare the C++P out of many Ks1 teachers who will either ignore it completely (in which case the curriculum is poorly framed as it is asking something which cannot be done), or they may come up with a notion of what an algorithm which is not correct and therefore risk confusing children unnecessarily. I searched in vain for any government support documents or extra guidance to help explain this concept of the algorithm to teachers who will be delivering this curriculum from 2014 and could find none. That is perhaps not unsurprising for a DfE which under Gove’s custody has become extremely good at dictating terms to schools, but not so good at supporting them. Just to be clear, I think that teaching older children (from KS2 onwards) about algorithms and computer programming is a great idea, but I see little evidence that the new curriculum takes account of what children at KS1 are able to learn (in a way which is genuinely) and what their teachers are able to teach them concerning the complexities of computing science. I think it would have been better to have framed the KS1 curriculum to have some programming in (as it does), and omitted the notion of algorithms at this stage to avoid unnecessary complexity (coincidentally a trait of a good programmer is to do this too). This would be something along the lines of ‘Pupils should be taught to understand that computers run programs which consist of a series of precise instructions’. For me this sounds more realistic, more achievable at KS1 and avoids the unnecessary fetishisation of the concept of the algorithm. But if you think differently, please go ahead and leave a comment. Author mjp6034Posted on July 8, 2013 July 9, 2013 Categories Computing Curriculum, Education PolicyTags algorithms, coding, computing, Education, Gove, programming, reforms, school, ue2 Comments on Scaring the C++P out of KS1 teachers…. In profit warning part I ( http://bit.ly/WCI8ut ) I argued that neoliberal pressure to allow schools to make profits were absolutely nothing to do with raising standards or improving outcomes for students. The motivation behind allowing companies to cream off profits from running state education is purely about profit and the enrichment of the elite who will own the largest stakes in these companies. If profit making companies are allowed to run schools, then standards will actually drop as they have done in the liberalised markets for energy and rail. Nor will the tax-payer make any savings, as the government will fund these schools places at least the same level as non profit-making schools, and pressure from neo-liberals may even create the same kind of distortions we are going to see in the NHS as ministers bend over backwards to create favourable conditions for profit making for private enterprise. Allowing market forces into education will not work for many reasons. When people talk of market forces and competition, it is interesting to probe what particular markets they are holding up as successful and vibrant examples of the capitalist genre. One such ‘market’ is food retailing and the domain of the supermarkets. It is true that competition to win the ‘weekly shop’ has led to unprecedented choice and value for Britain’s shoppers. The large supermarkets constantly innovate to get us through their doors, and for those resistant to the might of the big chains, many towns offer alternatives such as traditional markets, organic outlets and so on. As an example of competition and the profit motive driving up standards, it is hard to argue with food retailing, although the bullying tactics of the large supermarkets in squeezing margins out of their suppliers such as dairy farmers do reveal how even this text-book capitalist template has its negative consequences*. Schools are not supermarkets; education is not food shopping. If Tesco was a school, you would get to visit the supermarket as prospective customers on an open day and the manager would show you a powerpoint presentation of the facilities, for this is mostly what happens when parents set out to choose schools. If you liked it, you could put your name down and if successful you would then be allowed to shop there for the next 4, 5 or even 6 years. You’d better hope you made the correct choice, as you would only be shopping there and you wouldn’t be able nip along to another school to take account of a special offer, or a juicy 3 for 2 deal. You could transfer to another supermarket if they had a spare slot for a customer and you could bear doing all of the paperwork. This is the fabled ‘choice’ held up by Neo-liberals as the consumer pay off for accepting a privatised alternative to a state service. The choice here though is nothing but a chimera; you can’t shop around, split your shop up to get the best value or stop going to a particular store altogether as you can do with your weekly shop. Once the decision is made, you are captive, and captive customers can do nothing to influence the quality of the service they get. Profit making schools will probably do many things to ensure that they deliver a healthy profit to shareholders and senior management of the parent company. Firstly, as a school’s main budgetary outlay is staffing, particular the cost of teaching staff, they will seek out the lowest paid teachers (those with little experience), and whenever possible employ unqualified teachers on the lowest wages. Michael Gove’s announcement in July 2012 that unqualified teachers can now work in academies and free schools suddenly makes sense, paving the way for a way for profit making chains to commence the profit-seeking race to the bottom. Profit making schools in Britain may also look to the Charter Schools of America for handy tips on how to boost the bottom line. Reports on the Noble Network of Charter Schools in Chicago ( http://on.msnbc.com/WWxtrK ) reveal how they see parents as nice little earner on the side, and have created a system of ‘disciplinary charges’ to fine parents of students they believe have broken school rules. Some students have racked up hefty fees for their parents for what seems like trivial infringements. The potential for abuse here is astonishing. Schools needing some extra cash can simply mete out detentions to students (whether justified or not), and then soak the parents for ‘administration fees’. The ultimate irony is that a student with a poor disciplinary record is far less likely to be offered a place at another school, so the family is trapped into handing cash over. Schools will also no doubt be tempted to inflate other costs for parents, the school trip could no longer be a cost-neutral exercise, but have a hidden surcharge to boost the coffers, and the uniform could only be bought from the school, again with added margin to rip off the parents and enrich the schools shareholders. The blind belief in the power of the markets, despite the overwhelming empirical evidence of failure in energy supply, rail transport and so on is a very real form of coercion through which the state forces people to accept a second-rate service simply to increase the wealth of a narrow elite. Profits created are either the result of cartels (as with energy), or state funded monopolies (rail, and education if that ever comes to pass) being handed tax payers’ money. Nor does the state itself shrink as most free market advocates would wish, as government still has to fund these services through general taxation and have regulatory oversight to correct the most egregious failings of these quasi-markets create. * This was written before widespread contamination of Beef by Horsemeat was discovered in UK and Irish foods. Rather than modify the blog, I merely ask the reader to reflect on how the failure of the supermarket supply chain impacts the arguments made here about the perfectibility of markets. Gove’s education reforms, in particular his expansion of the academies programme and the launch of free schools, are moving inexorably to the moment where companies will be encouraged to run schools for profit. Gove let slip at the Leveson enquiry that he would be happy to see Free Schools make a profit in the second term of a Conservative administration and Think Tanks such as Policy Exchange have been agitating for quite a while to let providers make a profit from state education. A recent posting on this site (http://bit.ly/11EYNRc) called for the ‘profit motive’ to be allowed into education so that the ‘disgraceful situation’ of only 7% of state educated people getting top jobs could be remedied. Education is now being ‘worked-over’ in a classic neo-liberal pincer movement with the end game being the state allowing companies to take tax-payer money for providing a service, and extract a profit from this. The first part of the pincer movement is to comprehensively rubbish the existing state run system. Gove has been working hard at this from his time as shadow education secretary to the present day. He frequently cites the International PISA studies and England’s position in them. He relishes statistic showing Britain has plummeted down the league tables for Maths, Science and Literacy like a football pundit commentating on a team’s slide from Premiership dominance to 2nd division obscurity. The media have followed Gove’s lead and the general perception is created that schools are failing, that students leave with limited literacy, no understanding of science and mathematical skills equal to the average South Korean child at the age of just 6. How uncomfortable it is, then, when the very same international comparative measures show a different story. The company Pearson conducted a meta-analysis of the international comparative measures (such as PISA, TIMMS and PIRLS) and found that the UK came 6th in the league table of education systems in the developed world (http://bit.ly/VbKhL8). The combined school systems of England, Wales and Scotland beat the Netherlands (7), and beat Germany (15), and Sweden, the model for Gove’s free schools did not even figure in the top 20. Finland was the only European country to beat the UK, the other 4 countries were those Asian countries which always do well (Singapore, Hong Kong, South Korea) largely as a result of the extremely high intrinsic value placed upon education culturally. This composite did merge the English, Scottish, and Welsh systems into one but English schools are the largest proportion, and the Scottish and Welsh performance is very close to the English number. The conclusion is quite clear, the crisis in education we are constantly being told about is a construct, a convenient fiction, or a downright lie (take your pick). If the advocates of profit-making schools confronted reality, then they would have to admit that, whilst not quite world-beating, the schools in the UK are well above average and better than countries such as Germany so often held up as shining examples of economic prosperity and productivity. Of course the doom-sayers can always come back and say the measures used in this analysis are not the right ones and they paint a far rosier picture than is really the case, but Gove can’t have his cake here and eat it. He constantly used PISA scores to denigrate the system and convince people of the need for reform, so he’ll have to swallow it when the same measures show that things are not as bleak as he paints. This is clearly a case of PIRLS before swine. The second part of the neo-liberal pincer movement is to stress how much more efficient private enterprise would be running state schools. The argument here is that the state is a bloated, slow-moving dinosaur, unable to innovate or act quickly, whereas companies bring new thinking, new methods and can implement these rapidly and effectively. The motivation of a profit to be had at the end of the quarter focuses the company ruthlessly on results and outcomes, and the juicy lure of the bonus gives the organisation a hunger and desire which the dead-hand of the state could never have. Well if this is the case, and if it is going to apply to schools, then the neo-liberals have some more explaining to do, concerning the liberalisation of the rail network in the UK and the privatisation of energy supply. The bracing winds of the liberalised market were allowed to blow through energy and rail during the 1980s and 1990s, so these are hardly new reforms and have had a lot of time to bed in. By now, if the logic of the neo-liberals held true, then competition in the energy market should have delivered world-beating service and low prices to UK consumers for electricity and gas and a constant stream of new innovations. And likewise the rail network in the UK should be one of the most efficient in the developed world delivering great value for the traveller and clean uncrowded trains running exactly to time. The reality is once again very different. The UK energy market is confusing for the domestic consumer with an abundance of tariffs making best value very difficult to assess. In fact the failure of the market to deliver value for the customer has been a source of embarrassment for politicians, most notably David Cameron who promised legislation to force companies to put home-owners on the best possible tariff, but then had to backtrack on this when it turned out to be unworkable (http://bit.ly/VbLC4x) . On top of this, the big 6 energy companies are currently being investigated for what looks like a massive and cynical (even criminal), market rigging exercise (http://bit.ly/11EYNRc). The consumer was promised a competitive market; but neo-liberalism has delivered a cartel. Rail it seems has done no better from the neo-liberal experiment, UK fares are among the most expensive in Europe (popular commuter routes are sometimes 3x more expensive than comparative German or French routes), trains are crowded and dirty and the tax-payer subsidy for the network is much larger than countries which have retained public ownership of rail. On top of this the bidding process for the renewal of the West Coast Franchise went spectacularly wrong when it was revealed the winning bid had used profit projections for the final years of the franchise which were so exaggerated as to be either the result of gross incompetence or downright lying on the part of the bidders. Scrapping the bid alone has cost the tax payer over £40M. All of this profit making seems to come at a cost, a cost largely borne by the tax payer and the customer. What will be different about the contracts and execution of the deals which let private companies run state education to those which have gone so badly wrong in energy and rail? And if you have the answer to this question, can you please let the Energy and Climate Change Secretary and the Transport Secretary know as soon as possible, so they can correct the gross distortion and terrible value for the tax-payer operating in their respective areas. This blog post originally appeared on the Back Bencher Site http://thebackbencher.co.uk . Rumours abound that the Department for Education are going to be exhibiting at BETT. After Michael Gove’s appearance last year, he has had a team working around the clock to develop his ‘classroom of the past’ concept space. He strongly believes this space will settle once and for all the nonsense some vendors insist on peddling at the show when they come up with ‘Classroom of the Future’ type exhibits. Set to take the BETT show by storm, the ‘classroom of the past’ has many revolutionary design features not seen in classrooms since at least, erm , 1952. Security is tight ahead of its launch, but this copy of the brochure was leaked via a Hotmail account earlier today. Michael Gove is at the centre of another controversy. This time it’s over his planned new National History Curriculum. A ‘leak’ to the Daily Mail over the Christmas period led them to write ‘Some of the greatest figures in Britain’s past are to be restored to their rightful place in history, thanks to an overhaul of the school curriculum.’ (link – warning this takes you to the Daily Mail site) Gove it seems is no fan of some of the figure in the old (New) labour history curriculum, including William Wilberforce (leading light in the campaign to abolish slavery), Mary Seacole (Jamaican nurse who showed extreme courage in the Crimean war), and Amy Johnson (you know, the one with the plane). Instead Gove is insisting that schools teach first and foremost the history of England through its Kings, Queens, and major political and religious figures. To seasoned education observers, the obsession with ‘the curriculum’; can sometimes get a little tedious. Although the curriculum specifies the content which is to be taught, it’s a very reductive viewpoint indeed which equates learning only with content. Learning is a process, and being a historian is a lot more than being able to rote learn the dates of every British monarch. Far more important are the skills of weighing up conflicting evidence, creating narratives and understanding how events are linked. History is after all, just a collection of narratives; this is given away in its very name! 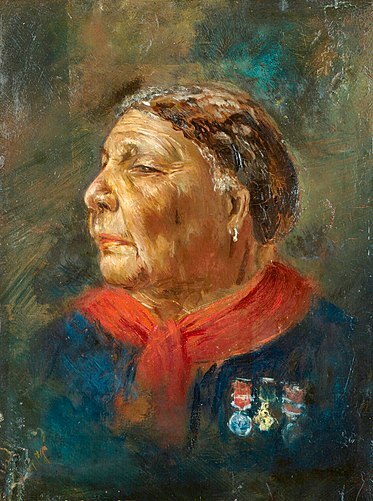 Figures such as Seacole are very useful to history teachers; they illustrate how people can overcome prejudice (in Seacole’s case both racial and gender based), to achieve remarkable things. Most of what we learn at school we forget, but stories such as Seacole’s have the potential to inspire young people. This is far from being an inclusion of the ‘PC brigade, or the loony left’ as the charge from Gove goes, but rather an opportunity to examine a fascinating period in British history and the prevailing social attitudes. It is telling that the figures which Gove wants taught are from the monarchy, the church and mainstream politics (Churchill, Nelson etc). Gove’s history curriculum sits proudly on his shelves in plush red leather with gold-tooled lettering. He is clearly impatient with the stories of ordinary people who challenged the status quo or fought for social justice, or women (like Johnson), who took on male dominance in a field like aviation and proved themselves equal if not better to men. Kings and Queens (of Britain) rule by divine right (this much I learned in my history lessons). God *tells* them they are in charge and this supremacy cannot be challenged in the earthly order. This suits Conservative ideology very well, it shuts down the narrative of uppity commoners getting to big for their boots. Studying the monarchy is an exercise in knowing your place and the lives of common people, their struggles, the battles they fought to achieve a modern democracy disappear from view. So Gove’s history curriculum is purpose built to reinforce, albeit on a very subliminal level, the agenda of his government, which is proving itself to be the most reactionary and socially regressive in living memory. Cameron’s cabinet is dominated by white men with an unshakeable belief they were born to rule, so it is very fitting that the history curriculum is stacked in a similar manner. In specifying so closely which figures are to be taught in History lessons, Gove shows himself to be quite the control freak, eager to wield his power so his particular take on history is the one played out in the exercise boards and whiteboards of the countries’ school. But if he is a control freak, he’s a hugely conflicted one as his flagship free schools don’t have to teach the national curriculum, nor do any of the academies. They are free to teach whatever they want, they can base their entire history curriculum on Malcolm X if they wanted to. Gove’s tenure as education secretary has been nothing but a mess of badly thought out policies and ideological blindness. 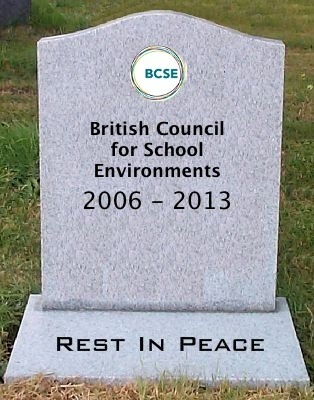 The British Council For School Environments announced this week it was to close with immediate effect. The reason give was lack of funding for it to continue its mission of working with the education, design and construction industries to create excellence in learning environments. Over the years I attended many BCSE events. These were mostly one day conferences bringing together architects, designers, representative from construction companies and of course education experts to have discussions which normally would not take place. These discussions would not normally have taken place as there were (are) very few forums where all of these people could get together, and as the BCSE was a charity, the people taking part were less interested in direct commercial activity, but rather learning genuinely new things from people they would’t normally get to meet. You went to a BCSE event not to win a contract, but to do some serious learning from people who things about learning environments which you did not. And for this, the events were very very useful. The years of BSF (Building Schools for the Future) were the heyday of the BCSE, with large amounts of money flowing into school design and construction which ensured the charity received the support it needed and of course as schools were built then where new designs and thinking were being used. When Michael Gove closed the BSF programme at a single pen stroke (and without due legal diligence), he didn’t kill the BCSE, but he certainly loaded the gun. With the final tranche of BSF projects ended or near ended, and with none in the pipeline, the cash dried up. The explanations from Gove for the cancellation of BSF are well known. He argued that the schools being built were far too expensive, and the procurement mechanisms overly bureaucratic and wasteful. And of course the biggest reason for cancelling BSF was the mantra of the coalition, repeated ad nauseum that ‘we have to bring the deficit down’. Gove’s replacement for BSF is the Priority School Building Programme, and he has been keen to stamp his authority on this with, for instance, frequent sniping at consultants and architects who he believed became rich under the BSF years of plenty, and a ban on the use of curves in school buildings. I attended the BCSE annual conference in 2011, held at the West London Free School. A fitting venue given Toby Young’s status as the poster boy for Michael Gove’s free school policy. Although billed to appear, Young did not materialise. However, the Conservative chairman of the Education Select Committee (Graham Stuart) did turn up and used his speech to confidently announce that the quality of a school building had no impact on learning. This was a bold statement and there were challenges from the floor, but Stuart had the look of a man who had made up his mind and was not going to countenance even for a single moment that he was wrong. Nor was any evidence, even anecdotal, going to persuade him that a well designed school environment could have a positive influence on learning. In short he had the look of a politician. And a politician cruising the policy freeway on a full tank of his own bluster and arrogance. It’s easy to dismiss Stuart as a buffoon; in fact it’s an excellent idea to do just that; but his point of view expressed at that conference is one which is now enshrined in policy as we move from the inspirational spaces of the BSF schools to the flatpack blandness of the Tory’s ‘Portakabin’ approach to school environments. So 2 years on, the BCSE is finished, and we talk of school buildings now as ‘a kit of parts’, as a flatpack assembly, as modularised, as standardised, as costed down to the last rivet. Creativity, individuality, flair, risk-taking have been drained out of the system and replaced with the permanent drab grey background of the years of austerity. 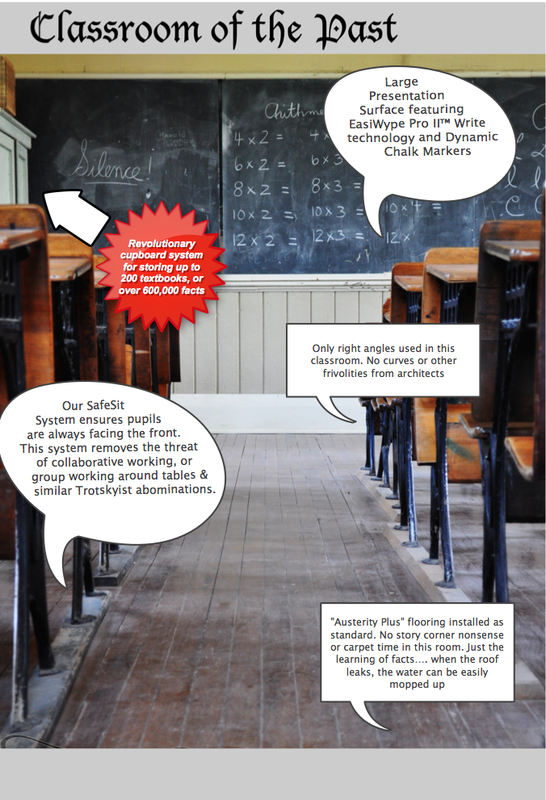 Corridors and canteens are smaller, classrooms will all be the same size and shape possibly leading to standardised seating in rows facing the front and there is little provision for flexible learning spaces. Cutting down the cash available for building schools seems to reinforce a particular pedagogical approach to education, with the teacher at the front imparting facts to a passive audience of students. This will gladden the heart of Michael Gove, representing as it does the perfect intersection of Coalition penny pinching and Gradgrindian pedagogy. The biggest problem with the Conservative approach to school environments is that the research shows that excellence in school design does have a positive impact on learning; for instance this study shows clearly that a good school building can have a positive influence on learning and grades. Once again the politicians have totally ignored the work of researchers and gone instead with their gut instinct and the herd mentality of their morally bankrupt party political beliefs. The paradox is that now the BCSE is dead, it is now more than ever that we need an organisation like it. Michael Wilshaw has weighed in again with another media friendly pronouncement on teaching (http://bbc.in/OQ80vk). In a move which has sparked a predictable backlash from teaching unions, Wilshaw the head of OfSTED and the most senior teacher in the land, outlined how teachers who did not teach well, or who left early (at 3pm was the cut off he used), should not be entitled to pay rises. An excellent analysis of Wilshaw’s strategy when he talks to the media can be found on Chips of Brookfields Blog (http://bit.ly/P9lG5Z) and Bansi Kara has written with insight and precision about why Wilshaw’s strategy ignores the reality of what happens in school and the basics of how you motivate people (http://bit.ly/TiuSLy). At one level this is just another piece of populist grand-standing from Wilshaw, an interview with theTimes destined to please the Daily Mail readership and setting up Gove nicely for his conference speech to the Tories in a week’s time. Ignoring it is probably the best strategy. But the image Wilshaw paints of lazy teachers driving out of the school car park at 3pm is calculated to raise the hackles of anyone who thinks teachers work too short hours, have long holidays and an all round cushy number, and can increase the antagonism between the teaching profession and the wider public. Gove has been waging a war on state education since he became shadow secretary for education, and Wilshaw’s interview seems peppered with sound bites which could have come straight from Gove’s mouth, which they may well have done! Wilshaw clearly shares his politics and views on teaching with Gove and as the months go by the partisan nature of this appointment appears ever more striking. Michaels Gove and Wilshaw (and wannabe ‘Michael’ Nick Gibb) all appear to have had the same lobotomy: a surgical operation to remove their creativity, imagination and ability to base their policies and pronouncements on facts and data, and a replacement of the resulting void with a fetid stew of authoritarian myopia and half-arsed sentiments from Rudyard Kipling. That the most senior politicians and leaders of education in this country can be so lacking in real insights in how to improve education and so bereft of meaningful policies is a national tragedy. Wilshaw’s explanation that his inspectors will mark down schools which give pay rises to teaching staff without justification is not only unworkable, it also contradicts the essence of Gove’s reforms to state education. Gove has put all of his political eggs in the basket of academies and free schools*, and central to this policy is the right for academies to set their own pay and conditions for staff, even employing teachers without qualifications if they want to. So Gove’s policy seems to trust absolutely management of a school to promote those worthy teachers and reward performance accordingly, and Gove is eager to brandish the word ‘autonomy’ whenever he is championing his academy policy. But then Wilshaw comes along and contradicts this. Is he seriously saying that his inspectors are going to inspect a school and then drill down to the level of detail where they ask the Senior Management to justify the salary of individual teachers and mark them down if this justification does not satisfy them. This is of course will be impossible and even if it were, this will be a government agency intervening right at the heart of a school’s management and staffing structure. Michael Gove cannot have his autonomous cake and eat it. His talk is all of autonomy and letting schools run themselves without let or hindrance by the local authority, but his actions and policies very clearly point to exactly the opposite situation, the micro-management of schools by proxy by OfSTED. His policies are confused and contradictory and in Wilshaw he has found an unquestioning attack dog to further his agenda. The sooner both Michaels are removed to a position where they can no longer influence English schools the better. *in terms of legal status, free schools and academies are the same thing. Free schools are just academies which are far more likely to be run by religious extremists or Tory journalists than regular academies. Image is creative commons, available here and used with kind permission of Goat’s Greetings on Flickr. Original image has been cropped. Author mjp6034Posted on September 22, 2012 September 22, 2012 Categories Education PolicyTags academies, autonomy, Gove, Michael Wilshaw, OfSTED, pay and conditions, teacher, teaching3 Comments on Going home at 3pm..